Florida Gulf Coast University junior Brandon Goodwin, #0, lays the ball up in the NCAA tournament first round game against Florida State at Amway Center in Orlando on Thursday, March 16, 2017. Olivia Akers, 17, leads a practice with the color guard during the game against St. Petersburg-Lakewood at Barron Collier High School in Naples on Friday, Sept. 14, 2018. Fatal Attraction driver Bonnie Walsh, 57, crosses the finish line to win the Big Feature in 54.35 seconds during the Budweiser Winter Classic swamp buggy races at Florida Sports Park in Naples, Florida on Sunday, Jan. 29, 2017. This weekend was her first time racing since her husband and fellow swamp buggy driver, Terry “T-Bone” Walsh, died in March 2016. Chris Anyzeski performs a backflip during the Pro Freestyle heat of the Pro Watercross World Championships at Sugden Regional Park in Naples on Sunday, Nov. 5, 2017. 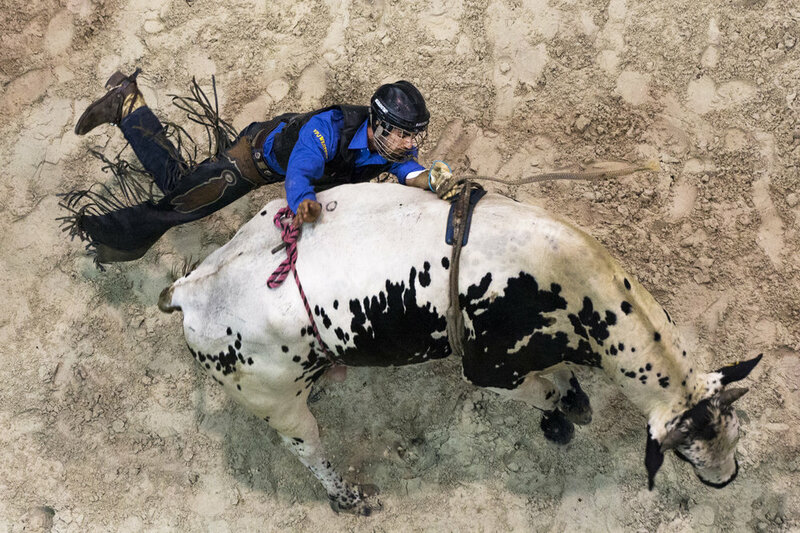 A bull rider falls off of his bull while competing during the second night of the Professional Bull Riders Touring Pro Division at Germain Arena on Saturday, July 29, 2017. Nick Tompkins, from First Baptist Academy, competes in the high jump during the Class 1A District 8 track and field meet at St. John Neumann Catholic High School on Tuesday, April 17, 2018. The Immokalee Indians color guard practices before the halftime show of the Harvest Bowl matchup at Gary Bates Stadium in Immokalee, Florida on Friday Sept. 2, 2016. The Tigers defeated the Indians 20-17. Volunteer Johnathan Konopik, 13, points out the course buoys to Natalie Pernia, 18, from Manatee County, before the start of her race during the Special Olympics Florida Area 9 Standup Paddle Competition on July 14, 2018 at Sugden Regional Park in Naples. Thad Berkhousen throws a left to the face of Armando Ancona during their Cruiserweight fight at the LC Pavilion in Columbus, Ohio during the Arnold Sports Festival on Saturday, March 7, 2015. Immokalee varsity football players grab a drink during the first practice of the season at Immokalee High School on Monday, July 31, 2017. Players run drills during practice at Gulf Coast High School in Naples on Wednesday, Sept. 20, 2017. Ohio University redshirt freshman running back Papi White (#4) carries the ball for a 36 yard gain against OU's rival Miami University on Saturday, Oct. 10,2015 at Peden Stadium in Athens, Ohio. White had a career-high 75 receiving yards. The Bobcats defeated the Red Hawks 34-3 on homecoming weekend. Women compete in the Ladies Senior Singles Bowls Championship at the National Centre for Bowling in Ary, Scotland on Wednesday, July 29, 2015. Michelle Bailey from Trinidad and Tobago warms up before heading on-stage for the Women's Bodyfitness Figure B pre-judging competition at Battelle Hall during the Arnold Sports Festival on Thursday, March 3, 2016. Kingussie shinty player Jake MacPherson (right) fights for control of the ball using his caman against his Glenurquhart opponent at The Dell in Kingussie, Scotland on Saturday, August 1, 2015. Shinty is unique to Scotland and one of the oldest games in the world. The Dell playing fields at Kinguisse are considered by some to be the original home of organised shinty as we know it today. Two men compete in a Backhold Wrestling match at the Bridge of Allan Highland Games. With the exception of kicking, the wrestlers are allowed to use every legitimate means to throw each other and the first one to touch the ground or break his hold loses. The referee counts over Karl Parks after a blow by his opponent Cory Delaney sent him into the ropes during the Super Middleweight fight at the LC Pavilion in Columbus, during the Arnold Sports Festival on Saturday, March 7, 2015. Robert Morris goal keeper Chelsea de Jager (#00) slides to block the ball from her Ohio University opponent Allie Curry at Chessa Field in Athens, Ohio on Friday, September 11, 2015. Ohio University shutout Robert Morris University 3-0. Runners compete in the track and field events at the St. Andrew Highland Games in St. Andrews, Scotland on Sunday, July 26, 2015.